It’s that time of year when spring fever makes us daydream lovely thoughts for our North Texas landscaping. If your home is your castle then your yard is your own private Garden of Eden. With a little planning you can add terrific color, warmth and texture to create a special atmosphere in your North Texas landscaping. Cheerful blooms will always make a home appear more welcoming. Grace your front yard and entrance with a bounty of annuals and perennials that will keep you bright with color throughout the season. Roses, petunias, peonies, and snapdragons are example of happy bloomers that bring charm to any setting. If the space from your home to the street is small a low fence along the front of the yard will add depth and character. It also provides a lovely setting for climbing vines. Select a variety of plant heights to add interest and dimension. Rambling vines are a staple in the North Texas and conjure up visions of romantic settings. The tendrils and foliage interlaced with blooms are lovely wrapped around fences, posts and columns. Clematis is a showy vine that offers a beautiful array of color choices. For a larger structure you can consider wisteria which delivers traditional southern charm. There are also many varieties of climbing roses that will offer show stopping color throughout summer and well into fall. Small shrubs or larger perennials can be located at the entrance to designate entry. Add attention to this area by choosing rocks or small, interesting pillars for emphasis. Place a fun marker with your house address that identifies your location to guests. The beds along the drive should have a variety of plant materials. For a soothing look, choose shades of one color or for more pizazz, vary the colors along with height and texture. Whatever you choose, be sure to place your plants at least a foot away from the edge of the drive to prevent being smashed by careless drivers. There is a diversity of plant choices for North Texas landscaping that don’t require a lot of fuss or attention. 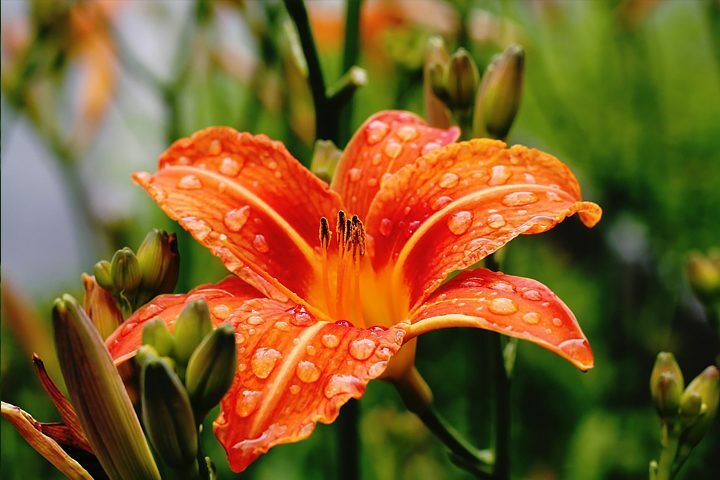 Lilies offer many varieties, like the crinums that handle drought and don’t need fertilizing. This choice also provides a lovely fragrance. Daylilies bring a wide assortment of colors and won’t demand your attention. Black-eyed Susan is a self-sustaining choice that will give you bright color well into fall. If you want more options, talk with a landscape professional for additional no fuss choices. You wouldn’t want a one-dimensional home and you don’t want it in your garden so keep varying sizes and shapes in mind for your landscaping. Planters and hanging baskets can pull attention to one specific area or detract from a not so extraordinary house feature. It’s a terrific way to develop visual interest with just a small effort. Window boxes are big on charm and create a feeling of abundance for any home. By including different levels of hanging baskets or pots you can produce a strong impression of joyful richness. Designing and planting colorful containers is a very rewarding experience – you can watch the magic develop all season long. When creating these contained gardens, keep in mind the popular guideline of thriller, filler and spiller. You want to choose plants accordingly. Something big to act as a focal thriller, something dense to add fill and something that cascade or drapes to add the spill. Viola! You’ve created contained beauty. Blooming shrubs can make an instant impact in your North Texas landscaping. The great variety of sizes offers plenty of options for adding height, dimension and texture. The bonus of delivering big, bright blooms is another reason to put these plants into your plan. Many shrubs bloom in the spring which gives your yard a nice pop of color early in the season. Also keep evergreen shrubs in mind to offer touches of green all year long. Welcome spring with visions of flowers dancing in your head. Then consider these tips to help you make your beautiful vision of North Texas landscaping a reality.